The 3d printer has been a useful tool. It opens up new possibilities, and it's a lot of fun! I could use some input from you guys on how I should proceed with the radiator. My plan is to use a PC cooling radiator. The main reason I would like to go this route, is to safe time. 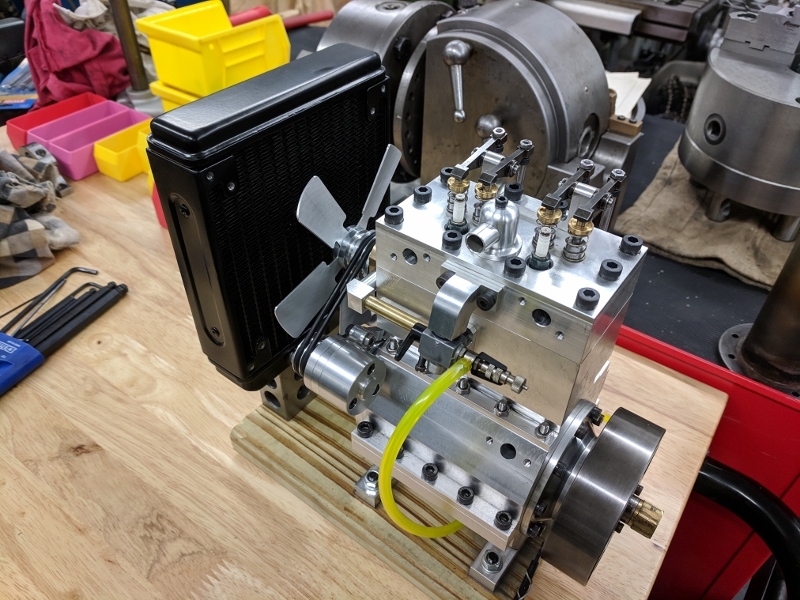 This engine build has been going on for quite some time, and I have a number of other project I would like to get started. And these radiators aren't bad looking either. I purchased a couple of 140mm and 120mm radiators. The thing where I'm scratching my head right now, is the plumbing. The PC radiator has the inlet and outlet on the same side of the radiator, and the coolant flows through it in a U shape. One thought I have is to plumb it the way it is with a tube from the top of the engine, where the coolant outlet is, down to the the radiator and through it. The block looking part below the radiator would be a tank to increase the coolant capacity. Another thought is to modify the radiator, by adding a cap and inlet at the top, and turning it into a more traditional radiator. 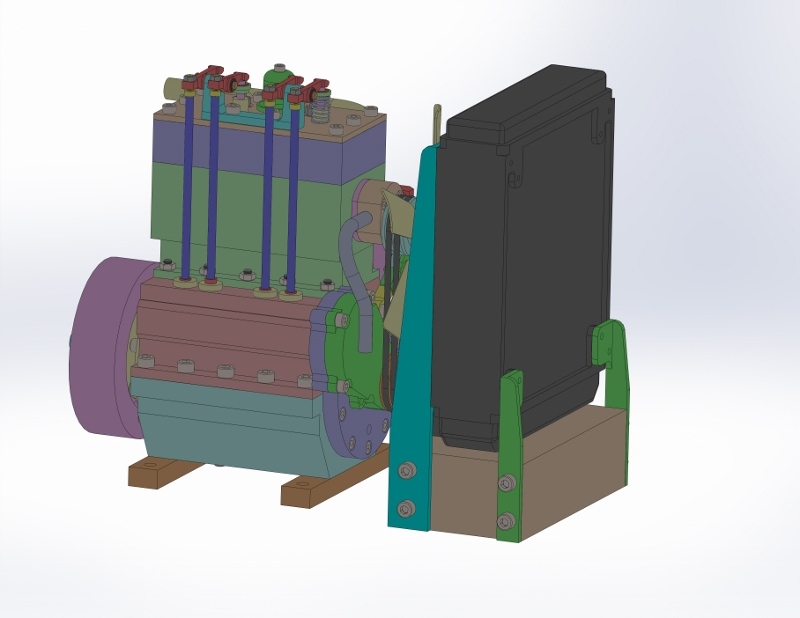 I modeled the 140mm radiator in CAD, to see how I could mount it. As a comparison, the 120mm radiator. I think this one is a bit small for this engine. Those are nice looking radiators. If you mount it with the inlet/outlet on the bottom, consider venting the top tank to purge any air when filling the system. Would laying the radiator on its side in cross flow configuration work? 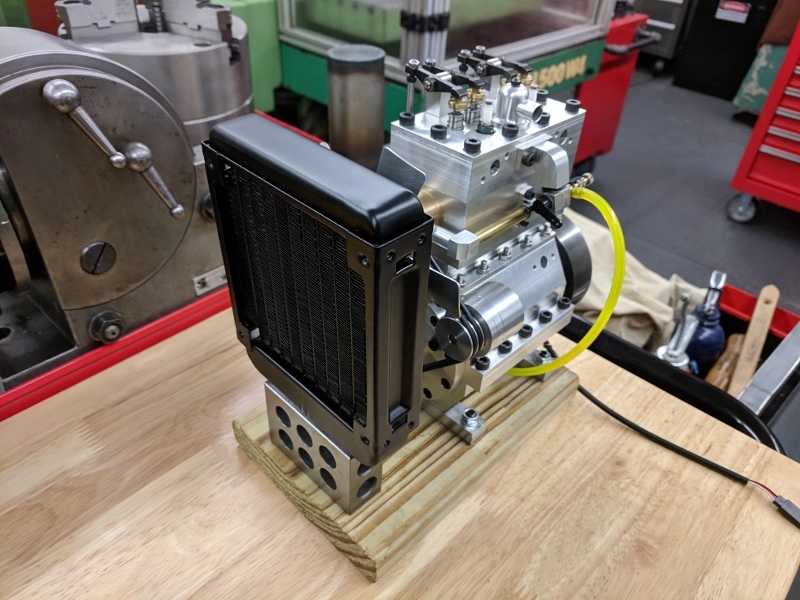 George has a modified radiator for his Ford V-8 made from computer radiator. See if he can add some advice. 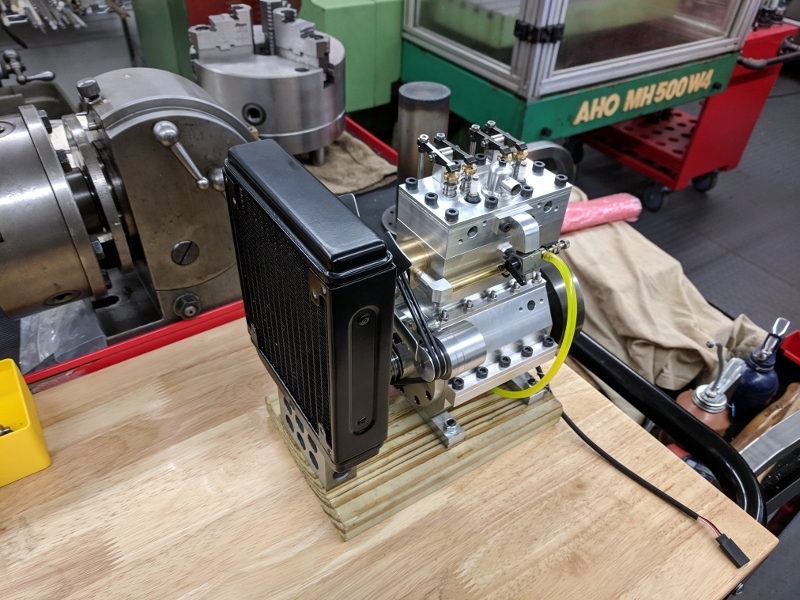 Chuck beat me to the punch, I was going to suggest the cross flow idea. It might make mounting complicated though. One other thing if you mounted the tank higher it would be like the standard expansion tank on a car. You could have the filler cap in the tank and not drill holes in the radiator. That could work without looking to ugly. When I used one of those radiators on one of my engines I found that there is a baffle in the tank. Where you see that crease in the tank is where the baffle is. 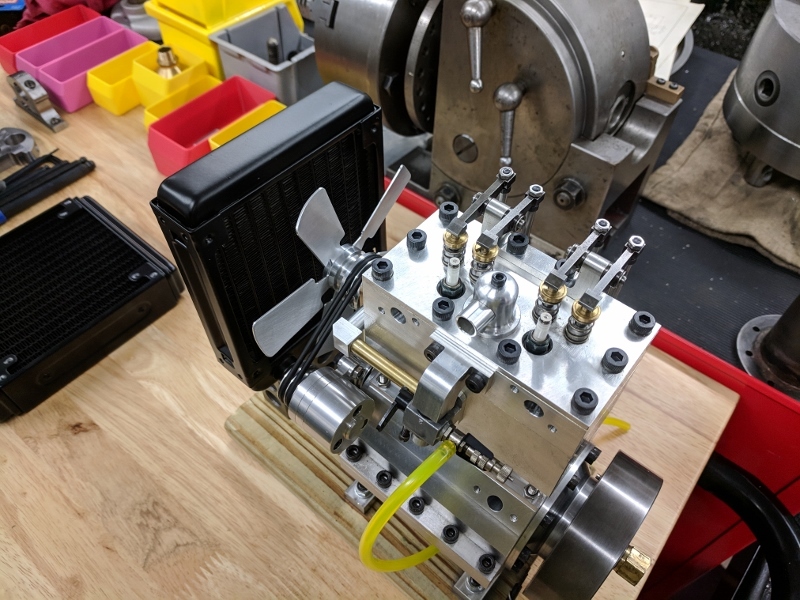 Most engines have the cool water going in the bottom of the engine or water pump and as it heats and rises it then goes to the top of the tank. I guess you could force the water through the rad with the way the fittings are but I plugged one and then made another and epoxied it to the narrow tank on the other end. When I drilled in the center of the large tanks is when I found the baffle. I went in with a rotary grinder and cleared out as much as I could for the water flow. Where I drilled the hole is where I installed the filler neck. George's radiator installation looks pretty slick. If you don't want to cut into the radiator, perhaps something like the attached sketch would work. The top tanks are still divided, but both have a way to vent air when filling the system or in case you get any combustion leak into the coolant. The orificed vent on the piping back to the engine will bypass just a bit of coolant but should not affect cooling much. Anyway, this might be a way to avoid modifying your radiator. You have a two pass radiator arranged with two separate cores and a partitioned tank at the coolant connection end. 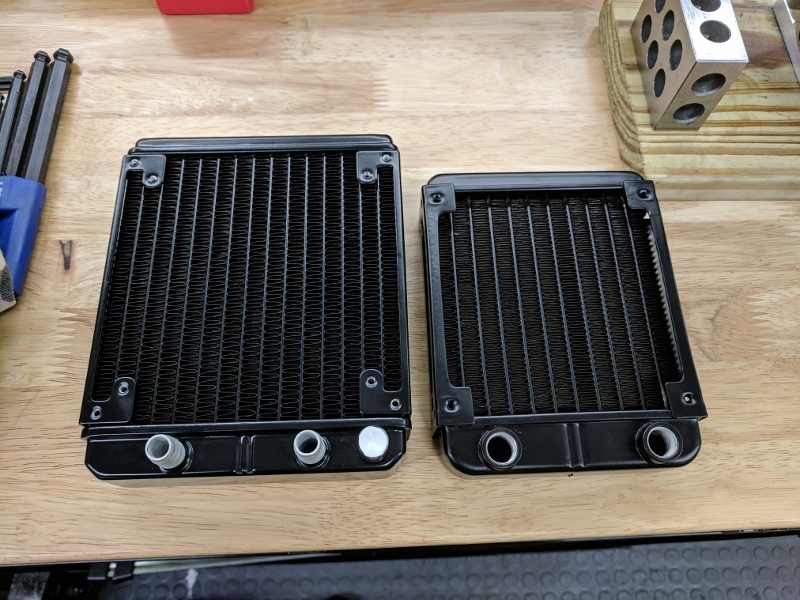 There are two reasonably good ways to apply these radiators to gas engine cooling. The first is as George has mentioned by cutting the partition and adding a new bottom connection. 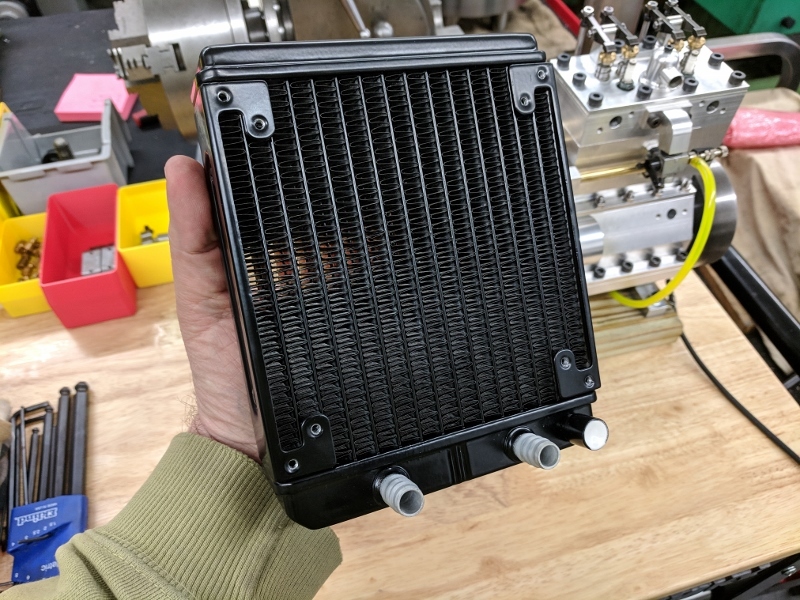 The other way requiring only one minor mod to the radiator itself is as Chuck and Art have mentioned, to rotate the radiator 90⁰ and mount it so the radiator coolant connections are on the side for a two pass cross flow cooling system. Your engine coolant discharge would then be plumbed to the top radiator connection. The bottom connection is plumbed to the suction side of the coolant pump. You still need to fabricate and mount a relatively small cylindrical expansion tank vertically on the coolant connection at the side of the radiator. This provides coolant fill port, expansion space, and proper venting. Tee a bottom drain of the expansion tank into the coolant suction line to the pump. You also need a small vent tube from the top most part of the top radiator core top tank into the side of the expansion tank near its top. This vents any entrapped air in the coolant to the expansion tank and it aids filling the system. The top of the expansion tank should be the highest point in the system and should be vented to the atmosphere. Filling the cooling system with a gear pump takes a little time or a drill motor to spin the engine, but it should purge the air out of the cooling system as you pour the coolant into the expansion tank. These little radiators have impressive cooling performance even with low flow electric computer fans. They are very efficient at their job. 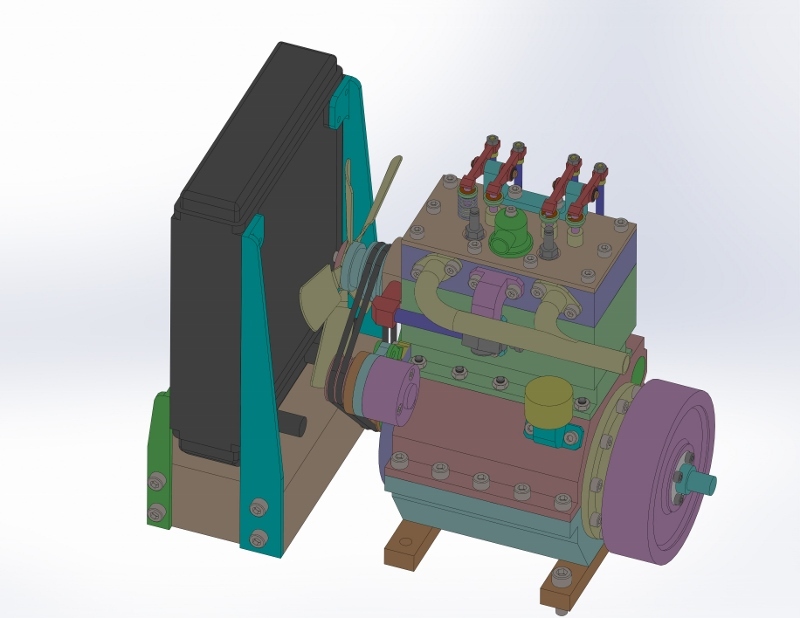 They were designed to cool with 10-15 degree F temperature differentials between coolant and ambient air temps. You will have a minimum 70-80 degree F temp differential to work with. The 120mm radiator is likely more than adequate. 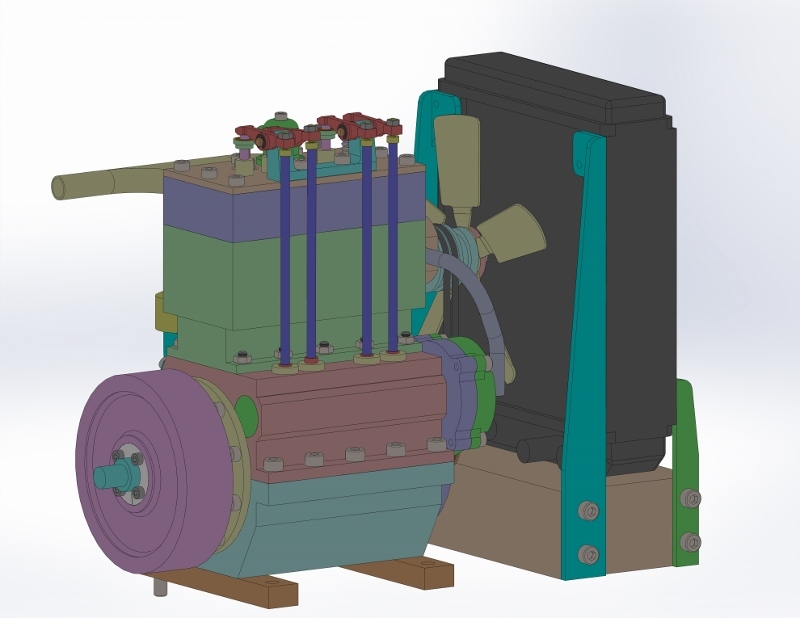 For example, I use a 120mm radiator on a 1” bore 4 cylinder gas engine model generator at 24 watts electrical load continuously for hours @ 70 degree F ambient with a 5 speed 120mm electric fan set on low/medium speed. Also note, since your engine is aluminum and your radiator is probably brass, there is a high probability that galvanic corrosion could take place between these two metals if an electrolyte is present (coolant). Either drain your coolant after use or pick a glycol based coolant with an inhibitor specifically for this condition. Thank you gentlemen for the input and great ideas! It's very much appreciated. I have a similar radiator as was planning to go crossflow with a T piece on the top connection to act as a filler/vent. So I should probably go back to making more errors that is if I could find the time - still nine years to retirement. Bad Behavior has blocked 14875 access attempts in the last 7 days.